Fill out all of the required account information and hit “Register” at the bottom of the page. You will then receive an account conformation email. Once you receive the conformation email, click on the “Confirm Account” button in the email and it will automatically sign you in. The first part of this process involves connecting the sensor into the sensor port. If the front of the device is facing you, the sensor port is the furthest left and largest port on the device. Establish the USB connection with your computer by plugging in the Type-A USB end of the chord (larger end) into the respective port on your computer and the Mini-B USB end (smaller end) into the smaller and furthest right port on the front of your ConnectSense device. You should see the green light blink on the front of the device after connecting the USB cable. After you have established the connection, leave the window open on your browser until it redirects you to a page titled “Wi-Fi Info.” From here you have to enter your Wi-Fi SSID (network name) into the indicated box and the Wi-Fi channel into its indicated box. If you are unsure of what Wi-Fi channel your SSID uses, check your routers configuration. The following page titled “Connect” is for you to verify your settings, click the “Connect” button if you are pleased with the displayed settings. While it is connecting it will display the status of what it is doing. When the device is finished connecting you will see the word “connected” appear and you will be redirected to a new page to configure your device’s settings. Once the device is connected you can begin to adjust its settings. For example, you can adjust things such as the name, location, and polling interval for your ConnectSense device. After you have your desired settings, hit the “Save Settings” button at the bottom of the screen and it will bring you to the sensor page for the device. If you click on the “Sensors” button at the top of the screen you can see previous sensors that you have set up. If you wish to set up other device simply follow this process again. View the video below for visual step-by-step instructions. Once you are logged into the ConnectSense setup page you can begin to configure your device. The first thing you need to do is select “Add New Device,” when it redirects you to the next page, begin to configure your device by clicking the “Via Wi-Fi” option. At this point you need to join the ConnectSense’s network. If you return to the browser and leave the window open it will automatically redirect you to a new page titled “Wi-Fi Info.” From here you have to enter your Wi-Fi SSID (network name) into the indicated box and the Wi-Fi channel into its indicated box. If you are unsure of what Wi-Fi channel your SSID uses, check your routers configuration. The page titled “Connect” is for you to verify that your settings are lined up with your access point; click the “Connect” button if you are pleased with the displayed settings. The website will ask you to wait about 45 seconds while the device is connecting. Once it is complete you will be redirected to a new page to configure your device’s settings. After the device is connected you can begin to adjust its settings. For example, you can adjust things such as the name, location, and polling interval for your ConnectSense device. Once you have your desired settings, hit the “Save Settings” button at the bottom of the screen and it will bring you to the sensor page for the device. If you click on the “Sensors” button at the top of the screen you can see previous sensors that you have set up. If you wish to set up other device simply follow this process again. The ConnectSense app provides a premium Apple HomeKit experience. This aggregator app can control and monitor the ConnectSense Smart Outlet as well as any other HomeKit device. From creating and activating everything from Scenes to Rules, this app is a one-stop-shop for all of your home automation needs. 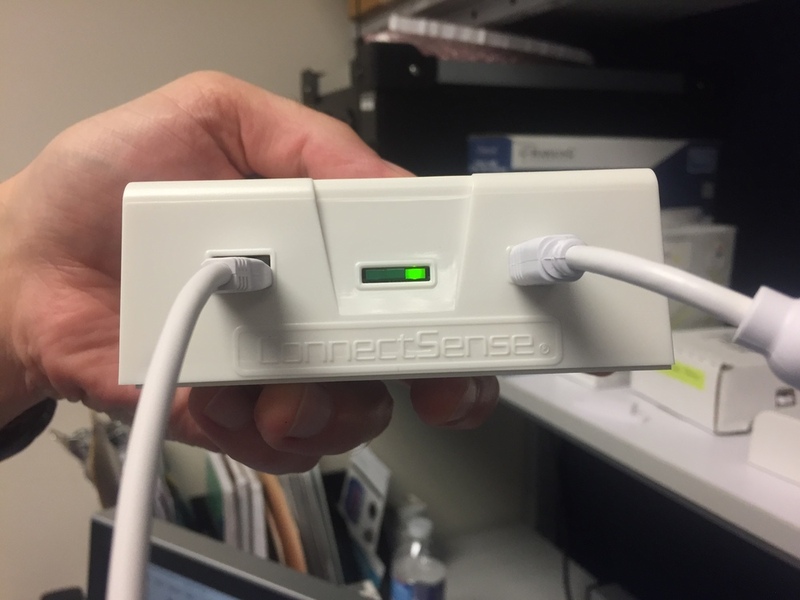 If you check your ConnectSense software and a sensor appears to be offline, there may be one of a few different potential issues. Here are a few troubleshooting tips for keeping your sensors online and for troubleshooting them if they go down. 1. Check the batteries. There is a possibility that they died before the sensor was able to send a low battery warning. If you are unsure if the batteries are the issue, try changing them out for new ones, just in case. We recommend plugging your ConnectSense unit into a wall outlet to avoid any battery issues. 2. Inspect the sensor cable and make sure it’s plugged in properly. Often times connection problems occur because the sensor cable came unplugged or because the cable was plugged in upside-down. If this happens, the LED on the right side of the ConnectSense unit will light up solid green. 3. Check whether the sensor is getting a strong Wi-Fi signal. We recommend that sensors receive signal strength of at least 50%. It is easiest to evaluate this by simply testing your smartphone’s connection strength in the same area that the sensor is placed. If you don’t seem to be getting a strong Wi-Fi signal, try moving the ConnectSense unit and router closer together. Also, check for anything that may be interfering with and blocking the Wi-Fi signal. This may mean that you have to move your router or ConnectSense unit to allow for a clear Wi-Fi signal between devices. 4. Check your router. Some of the newer Wi-Fi routers on the market have an auto-channel setting that will likely send the ConnectSense device offline. When the sensor first connects, the router gives it a specific set of parameters. When the router automatically changes its channel, the ConnectSense unit will not automatically change with it. To get your sensor back online, restart the setup process so that the sensor can access the new parameters. To avoid this problem, set your router to always remain on the same channel. Also, keep in mind that the ConnectSense Sensors are not compatible with a 5 GHz router. If you have a newer router that can switch back and forth between 2.4 GHz and 5 GHz, make sure that it stays at 2.4 GHz or your sensors will not be able to connect. 5. Make sure you entered your router’s SSID and password correctly. If entered wrong, the ConnectSense platform may freeze or continue to cycle through router parameters but then never connect. Most issues with incorrect passwords are due to special characters used in the password. Unfortunately, if your ConnectSense unit goes offline while you are away, there is no way to fix it remotely at this time. For questions regarding the troubleshooting tips above and other technical support of ConnectSense sensors, call Matt at +1 (630) 245-1445.